I write this instalment of my blog from the stunning island of Tioman. Seven weeks into my internship I had settled well into life in the Philippines when to my surprise and delight I was asked to assist Chloe on a Green Fins Capacity Development program on Pulau Tioman; an island off the East coast of Malaysia. 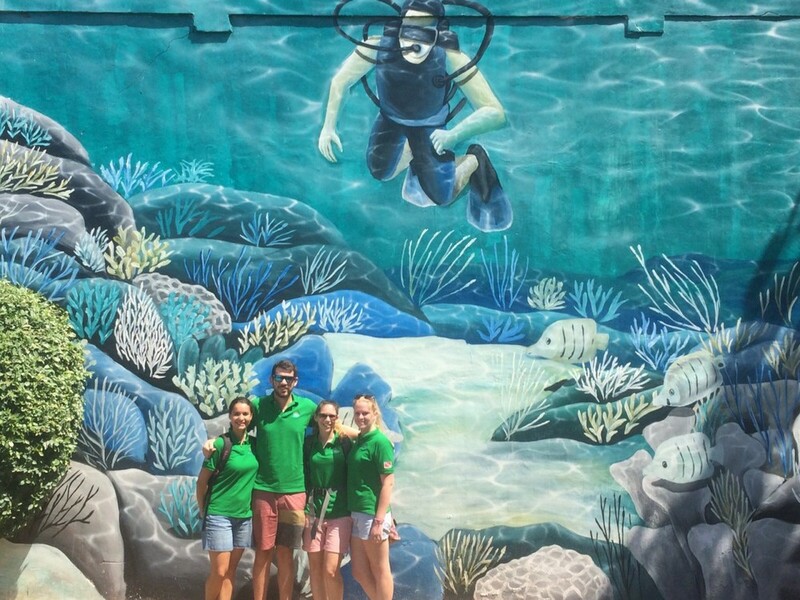 A brilliant opportunity to experience and work on the Green Fins project from another angle and gain a wealth of experience and skills in a country I had never been to before. As if carrying out this internship in the Philippines wasn’t amazing enough… how could I say no! Travelling to Tioman was a bit of a trek involving trikes, taxis, boats, buses and a plane ride - not in that order. The journey took two days with stop over’s in Kuala Lumpur and Mersing as there were no flights running to the island. On the plus side the 6 hour bus ride from KL to Mersing allowed me to see more of Malaysia…with its many palm oil plantations that stretch on as far as the eye can see; but also some lush, green rainforests. A bumpy ferry crossing from Mersing to Tioman and we were here. We have very kindly been housed in grounds of the Department of Marine Park Malaysia (DMPM) whom we are working with on the island. Within the first day we met some of our very interesting neighbours - some very bold long-tailed macaques that live in the rainforest behind us (they don’t get the name ‘cheeky monkey’ for no reason! ), monitor lizards and LOTS of cats! The cats seem to love people who are not so keen on them…namely Chloe and I, who seem to have unwillingly ‘adopted’ a couple that reside around DMPM. So far we have had the chance to have some inspiring and eye-opening conversations with some amazing guys from Reef Check Malaysia who we are collaborating with and who will be helping to continue the Green Fins work here on the island along with some great guys from DMPM. It is brilliant to see the positive influence Green Fins has had from when it was first implemented on the island in 2009 by Chloe and JJ. Of course there is still work to be done but the dive centres have welcomed Green Fins back with open arms and have been incredibly helpful and accommodating. Most of those assessed in 2009 have maintained the positive changes they made as a result of their Green Fins Assessment last time around which is a true testament to the benefits and success of the project. The reefs around Tioman that I have visited are pretty healthy and resilient but it is clear to see that these valuable ecosystems are under pressure from tourism and they need to be protected from the impact we as divers and snorkelers have on them as well as other human impacts such as pollution caused from rubbish/run off. The number of snorkelers on the island is vast and although it is not yet high season here on Tioman there are a good number of divers around as well. Seeing a fin kick destroy live coral that has been growing for hundreds of years is heart breaking. Broken and dead coral is not what divers come here to see so any opportunity to create awareness about the importance of these reefs and how to mitigate the threats we bring to them as divers/snorkelers is a very good thing for all involved. Green Fins has an important role to play here and with the help of the Department of Marine Park Malaysia and Reef Check I believe further successes will result. DMPM have already installed and continue to maintain (with the help of the dive centres) numerous mooring buoys at the local dive sites and along the shore in the marine park so it is clear to see that those based on the island do have a sense of responsibility and appreciation of how special their marine environment is here. I must admit that another reason I was excited to come to Malaysia was for the food. Chloe and I have had local food wherever possible including roti canai for breakfast and dinner (not in the same day although I would have happily!) with very sweet pulled tea or very sweet coffee. We have also had the opportunity to attend two Malay wedding celebrations with some very kind and hospitable locals. You never know what surprises will arise when working with Green Fins!